On January 2018, Simcy Creative launched a new version of Signer which is feature rich, powerful and seamless. To check what new of version 3.0, refer to Signer Change-log. Signer version 3.0 and later is build on an MVC model which is completely different from the the older versions that were build on legacy PHP. Also we made some major changes on the database structure that’s why you will need to do an upgrade of your install. Signer Version 3 still has the uploads folder. On this step, you will copy your files from . your old signer installation this the new one. This is because the internal structure of the folder changed. Signer version 3.0 has major database updates and updating them one by one could be a challenge so what we will do is create a new database, import the new database structure downloaded with version 3.0 the import data from the old database with the help of an app we created just for this purpose. Check on Signer Documentation on how to install and add your new database. After that come back here and continue on how to import data from the old database to the new database. We are assuming you have finished installation of Signer Version 3.0 and now you are ready to import your data. 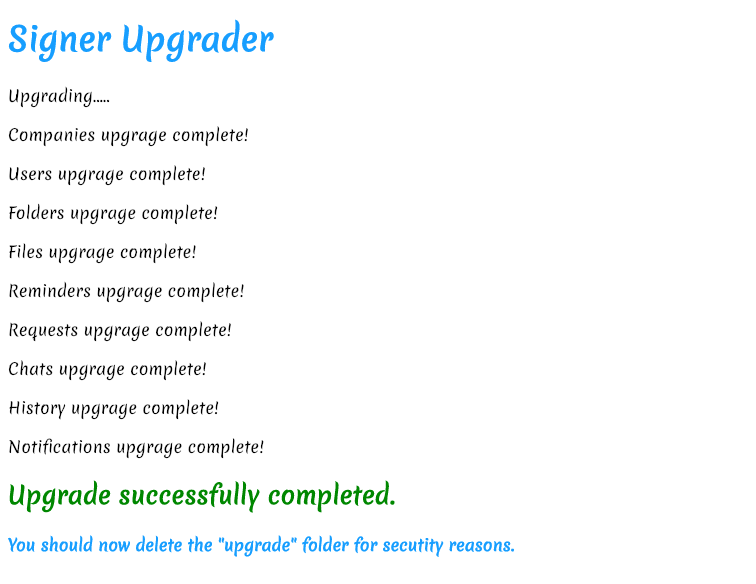 On your download folder from CodeCanyon, you will find a folder called “upgrade”, copy this folder and paste inside your Signer installation. Open inside the upgrade folder and edit the index.php file inside. Change the database info and enter the database info of your old database. Now you database data import is complete and you should delete the upgrade folder you just added. It is very dangerous if left there. Since you have complete the upgrade, from now on you wiill inly need to follow the documentation on how to install and update. no More upgrades will be needed, just simple updating procedure.